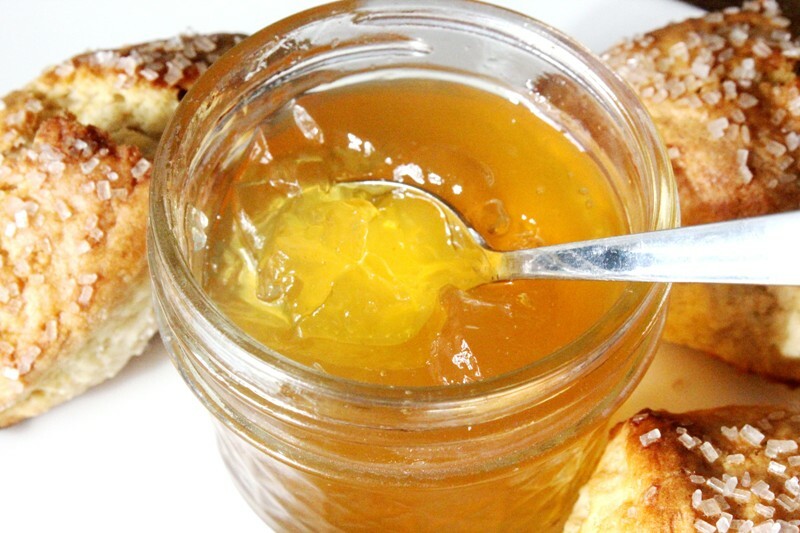 Continuing my love of all things citrus in the winter, here is an amazing recipe for Orange Spice Jelly taken from the National Center for Home Food Preservation (NCHFP). The final flavor is warm and delicately spiced. It’s heavenly spread on pancakes, toast, or scones. The NCHFP is a great resource for anyone interested in canning and preserving at home. If you’re not interested in going to the extra trouble of canning, you can simply refrigerate your jelly instead. If canning, sterilize canning jars and prepare two-piece canning lids according to manufacturer’s directions. Mix orange juice, lemon juice, and water in a large saucepan. Stir in pectin. 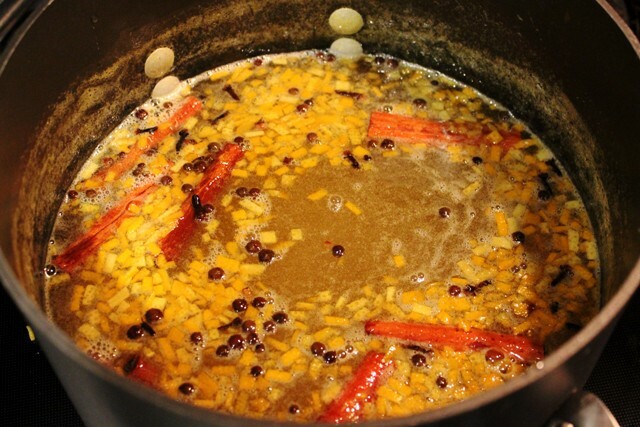 Add orange peel, allspice, cloves, and cinnamon sticks. Place on high heat and, stirring constantly, bring quickly to a full rolling boil. Add sugar, continue stirring, and heat again to a full rolling boil. Boil hard for 1 minute. Remove from heat. Skim off foam and strain. If canning, keep mixture hot and pour into hot, sterile pint or half-pint jars, leaving ¼ inch headspace. Wipe rims of jars with a dampened clean paper towel; adjust two-piece metal canning lids. Process in boiling water for at least 5 minutes. (If you live at an altitude higher than 1000 feet, longer processing times are required.) Allow to cool upright and untouched for 12-24 hours. Refrigerate any jars with popped up lids. If you’d prefer not to can this recipe, you can simply pour the strained jelly into any container and refrigerate.